These headwinds may prevent the industrial giant's stock from heading higher. Between divesting its massive financial services business, investing heavily to expand its digital offerings, and working to transform itself into a highly focused industrial company, General Electric (NYSE:GE) is in the process of reinventing itself for the 21st century. Along this journey, General Electric has several notable opportunities it can tap into for growth. However, tapping into new growth may not necessarily translate into a higher stock price. After all, GE is a massive company and it takes a lot to move the needle. At the same time, the company is dealing with a sluggish and volatile global growth environment that's inhibiting its ability to drive revenue growth. Finally, there's the overhang of continued weakness in energy markets, which is affecting almost 16% of its industrial revenue. Simply put, there are three great reasons to consider selling GE's stock. Based on Wall Street consensus, GE is estimated to generate $125.5 billion in revenue next year. With such a massive revenue base, $1 billion in incremental revenue represents less than 1% of this full-year revenue estimate. Put another way, if GE experiences pockets of successful growth that tacks on a few billion in additional revenue, it isn't likely to move the needle in any significant way. For instance, GE has made it a goal to grow revenue from its software business, which generated around $5 billion in revenue last year, to $15 billion per year by 2020. While this represents an impressive 24.6% compounded annual growth rate over a five-year period, it's peanuts compared to the company's 2017 full-year revenue estimate. Assuming all else stays equal and the growth rate is constant, and using GE's 2017 revenue estimate, this scenario would grow GE's full-year revenue by $2 billion per year, or about 1.6%. During the second quarter, GE reported that its non-GAAP industrial revenue increased by 7.7% year over year, to $28.2 billion. However, without the $3.2 billion revenue contribution by Alstom, which GE acquired late last year for $10.1 billion and wasn't part of the company during the second quarter of 2015, GE's industrial revenue would have fallen 4.5% year over year, to about $25 billion. On an organic basis, which adjusts for currency fluctuations, dispositions, and any other acquisitions, GE's industrial revenue fell 1%, to nearly $24.5 billion, during the quarter. 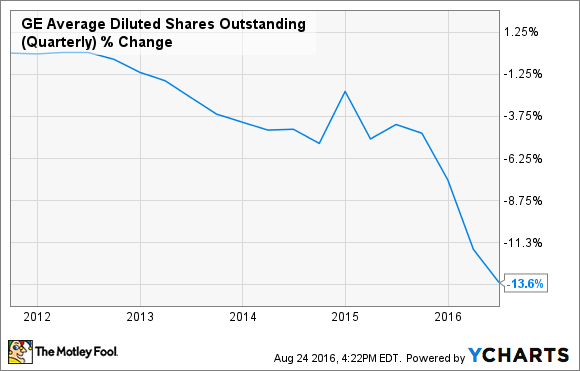 GE Average Diluted Shares Outstanding (Quarterly) data by YCharts. The ongoing weakness in energy markets continues to pressure GE's oil and gas and transportation segments. GE CFO Jeff Bornstein noted on the company's second-quarter earnings call that "rig counts are down 55% year over year and down 79% from year-end 2014. Well counts are down 58% in the US versus the second quarter of last year and down 76% from the third quarter of 2014, their peak." Later on the call, Bornstein also acknowledged that "in the second quarter, North American commodity carloads were down 11% driven by coal down 27% and petroleum down 20%. Intermodal volume was down 5%. Parked locomotives have more than doubled over the last year." All told, GE's second-quarter oil and gas revenue fell 22% year over year, to $3.2 billion, and operating profits fell 48%, to $320 million. GE's transportation revenue fell 13%, to $1.2 billion, which translated to operating profits falling 18%, to $273 million. Combined, these struggling segments represented about 15.6% of GE's industrial revenue and 14.4% of its operating profit in the second quarter. While GE is a diversified business that can withstand the challenges it faces with its oil and gas and transportation segments, it's clear that these drags are holding back the company's growth potential. When deciding whether to sell a stock, it's important to consider both sides of the argument. As far as GE is concerned, the company faces several notable challenges that could limit the stock's upside. But at the same time, GE is working to improve its earnings prospects through various digital and industrial initiatives, which are aimed at enhancing profitability. Ultimately, investors thinking about selling GE will have to decide whether these headwinds could drown out its longer-term opportunities.